After graduating from Wabash High School in 1970, Brenda signed with Decca Records, her sister's label. However, since there was already a singer named Brenda Lee with Decca Records, she was asked to change her first name. Loretta Lynn suggested the name "Crystal" after seeing a sign for the Krystal hamburger restaurant chain. Brenda Gail Webb thus became Crystal Gayle. In 1971 she married Bill Gatzimos, her high-school sweetheart; they have two children. In January 2007, fugitive Christopher Daniel Gay escaped from custody at an Interstate 95 welcome center near Hardeeville, South Carolina, and made his way to Tennessee where he stole Gayle's tour bus. Gay drove the bus from Whites Creek, Tennessee, to the Daytona International Speedway in Daytona Beach, Florida, parking the bus in a VIP spot next to NASCAR Nextel Cup driver Jeff Gordon. Gay was arrested the following day and the bus was returned to Gayle. Gayle is currently working on a new album, her first in 13 years. She states that the album will be covers of country music classics and is currently under the working title Am I That Easy To Forget. 2017 will mark the 40th anniversary of We Must Believe in Magic. 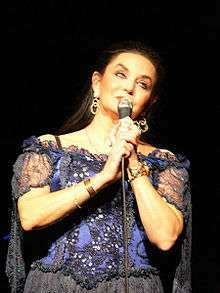 On November 15, almost 50 years after making her debut as a guest artist, Crystal Gayle was asked to become a member of the Grand Ole Opry by Carrie Underwood. The two performed "Don't It Make My Brown Eyes Blue" before Underwood announced the invitation. Gayle will be officially inducted by Loretta Lynn on January 21, 2017. ↑ Herald-Journal, July 25, 1993. ↑ Russell, Steven. "The Last Outlaw (The Ballad of Christopher Gay)". Maxim August 2007. pp. 102–8. ↑ "Crystal Gayle Chat 2016". countrystarscentral.com. Retrieved August 18, 2016.